“There is good reason why owners tend to overlook the need to bring their cats to the veterinarian. Cats, have in their nature, the ability to tolerate and mask signs of pain. Thus many owners cannot recognise that their cat is sick! By the time they recognise their cat is suffering, often times the disease would have progressed to severe stage and/or is too late to treat. 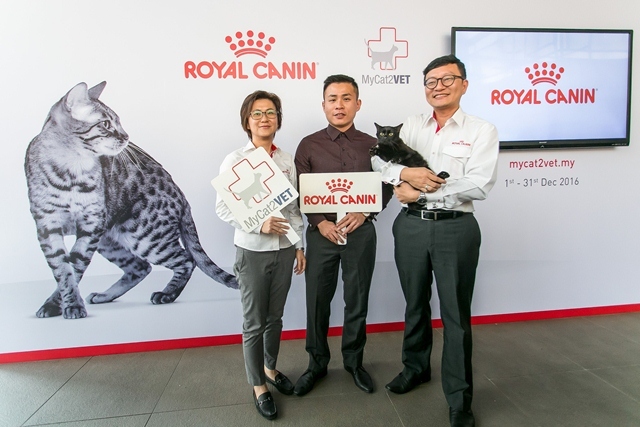 Royal Canin Malaysia has enlisted the support of 200 veterinary clinics all over the country where pet owners can take their cats for check-ups. Under this collaboration Royal Canin Malaysia will pick up the tab for the cat’s check-up. • The older a cat gets, the more likely the owner is to take it to the veterinarian, but only when it is sick. By then, it could be too late. • Routine wellness exams are vital for giving cats the long, happy and healthy lives they deserve. • Cats age much more rapidly than humans. • Vet visits are an opportunity to let your veterinarian know about any behaviour changes. • Preventive care is better than reactive care. Regular veterinary visits ensure that cats are up-to-date on all vaccinations and parasite prevention. Annual visits are essential to maintaining health and wellbeing, but cat owners should be conscious of other factors that display the need for more frequent visits. Changes in appetite, water consumption, house-soiling, breathing and behaviour patterns are all signs that your cat may need a check-up before its yearly visit. “Our goal is to have 10,000 cats making their first visit to the veterinarian as a result of this campaign. Those who are interested can log on to mycat2vet.my for full details of the registration and panel clinics that are available,” Dr Cheah added.